What is the Access Clearing Statement? Now, that’s what will sound like gibberish that you’ll hear Access Facilitators say and there’s an explanation that may make better sense to your cognitive mind, but you know what…you don’t have to understand it because the clearing will work anyway. It’s short speak for pages and pages of questions that are condensed down into this brief statement. Just say this smaller statement that stands for all the other stuff. The Access Clearing Statement™ is used to undo the positive or negative charge that holds limitation in place. Asking questions bring up a certain energy and then the statement allows space for another choice and another possibility to show up. You might notice that when you hear a facilitator run a clearing statement; you feel a wave, a breeze, a shiver or you get sleepy, or spacey and can’t comprehend. I tend to yawn…a lot. It moves through you and then you notice an expansion and a greater awareness. How Does the Access Clearing Statement Work? Many modalities clear the limitations built around words. The Access processes clear the energy underneath the words. The beauty, magic and potency of the Access Consciousness Clearing Statement™ is its capacity to clear the hidden stuff that you aren’t even aware of that is keeping you stuck! So, you don’t need to go through the pain, suffering and gory of reliving a situation to clear the charge on it. How does it get even better than that? Now that you know about the Access Clearing Statement™, the next step is to learn more about how to use the audio processes and loops so you can start to destroy and uncreate your stuck points of view and limiting beliefs holding you back. Thousands of people listen to Access Consciousness' founders Gary Douglas and Dr. Dain Heer on their Voice America Empowerment Radio Show every week where they use the Access Clearing Statement™ and listeners receive the processes on the air. 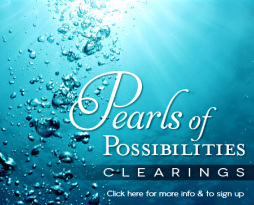 They host their show every Thursday at 2pm Pacific / 5pm Eastern and you can now receive a Pearls of Possibilities membership for $10/month that sends you the audio recordings of each show's processes so that you can receive deeper change and greater possibilities. It's a great place to start!